What struck me most profoundly when I first began researching World War One was the incredible slaughter involved. Yes folks, slaughter – according to Collins English Dictionary, the “indiscriminate killing of large numbers of people”. Wave after wave of soldiers sent ‘over the top’ to certain death. And if that wasn’t sufficient to make me reel with horror, add in the hellish conditions under which men lived for weeks, months and years, every day expecting to die some horrible death. My grandfather was there. He was tall, dark haired, rather angular in limb and face. And he was smart, dedicated to his family, a man who believed in God and went to church every Sunday. Occasionally he was funny, although I remember him as a generally quiet man. The war took one of his lungs – a gas attack – and he died at the age of seventy-five. My first novel, Unravelled, was based very loosely on his life and that of my grandmother. 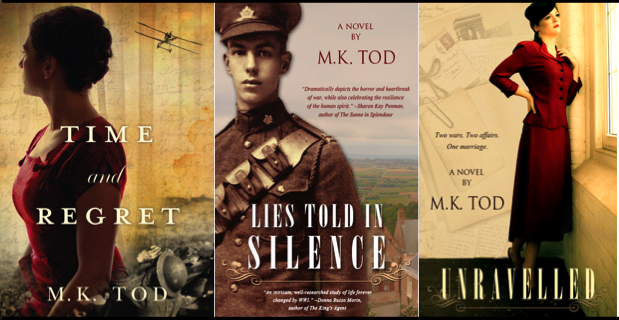 My second, Lies Told in Silence, told a parallel story of the fictional woman he met in France and is also rooted in World War One. In each novel I’ve attempted to help readers appreciate what that war was like for soldiers and civilians, men and women. As children we find it hard to understand our parents, to empathize with their worries and cares. As grandchildren, it is even more difficult to understand the lives of someone fifty or sixty years older. But now, I feel a deep sense of connection to my grandfather and grandmother. Through research, travels, novels, conversations with my mother, and my grandfather’s and grandmother’s scrapbooks I now understand the circumstances of their upbringings, the strictures and taboos of the time, the aspirations they had, the way they lived, the clothes they wore, the role religion played in their lives. Through visits to memorials and museums, the diaries of men who fought in WWI, and the exploration of government and private websites dedicated to WWI, I understand the devastation my grandfather experienced on the battlefield and the lingering effects of the war on soul and psyche. Time and Regret – my latest novel – is set partly in WWI and partly in the 1990s and I like to think of it as reflecting my own journey into the past. While attempting to solve the mystery her grandfather has left for her, Grace Hansen, the heroine of Time and Regret, explores her grandfather’s past and the war he fought in. Through his diaries, conversations with her grandmother, and her journey to the battlefields and memorials in France, Grace comes to know a different man from the one she knew as a child. I too know my grandfather as a different man than the Grandpa of my childhood, and I admire him more than ever. PS – that’s him on the cover of Lies Told in Silence at the age of nineteen going off to war. You can preorder Time and Regret from Amazon.com, Amazon.ca, Amazon.co.uk and other Amazon sites. My first historical project is set in Chicago in 1926, but my next project will be set in Europe, probably the Weimar Republic, probably in the same years. I’ve just started reserching and I’ve quickly realised I can’t handle 1920s Eaurope without knowing WWI. I’ve just finished “Fire and Blood – The European Civil War” by Enzo Traverso. Fantastic book, my introduction to that period. Traverson’s theory is that there were’t two wars devided by a period of peace, but there was actually one war which lasted 30 years. Fascinating theory that actually makes a lot of sense. The part dedicated to WWI was the best… with this I mean the part that involved me the most. Although we do study WWI in school, no one ever told us what it was really like, if what it was like is what Traverso tells in his book. An absolutely horrifying experience no one was prepared for back then. I think sharing stories about the war is so important, because stories touch the heart of people in a way lessons never will. The further we go from the event, the more important it become to remmeber. To keep the memory alive. Your novel is set in such an interesting time, JazzFeathers. An intriguing perspective by Enzo Traverso on a 30 years war. One aspect about Europe not to be forgotten is how many wars occurred there over the centuries. Plus what we think of as borders – country definitions – are relatively modern. To say nothing of constructs like the EU!! Good luck with your writing. “The incredible slaughter.” The more I know about WWI, the more that loss of life troubles me. Careless. Senseless. Wanton. The descriptors go on. A book that grasped the pointlessness of the slaughter as well as any is “Eleventh Month, Eleventh Day, Eleventh Hour” BY Joseph E. Persico. This book focuses on the last day and hour of WWI, when everyone knew the war was over yet soldiers were sent to their deaths for reasons that defy explanation. Looking forward to reading “Time and Regret” Mary. Thanks for your comment, Carol. Had not heard of that book and will have to look for it although I confess to being a little fatigued of WWI books after 6 years of reading about it. One of the reasons for changing time eras in my next novel!! Mary, I’ve pre-ordered Time & Regret on Amazon and look forward to reading it.